Do you know what you need to stop worrying about? What you CAN’T control! Motivated salespeople don’t waste energy worrying about what they can’t control. They stay focused on what they can control. You CAN control your attitude. You CAN control your use of time. 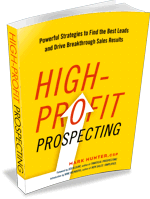 PrevPreviousStop the Insanity of the Stupid Prospecting Email!